Competitive Supercross in Germany is in bad shape. There is a lack of riders of an international caliber. But all that could change – with Carl Ostermann. 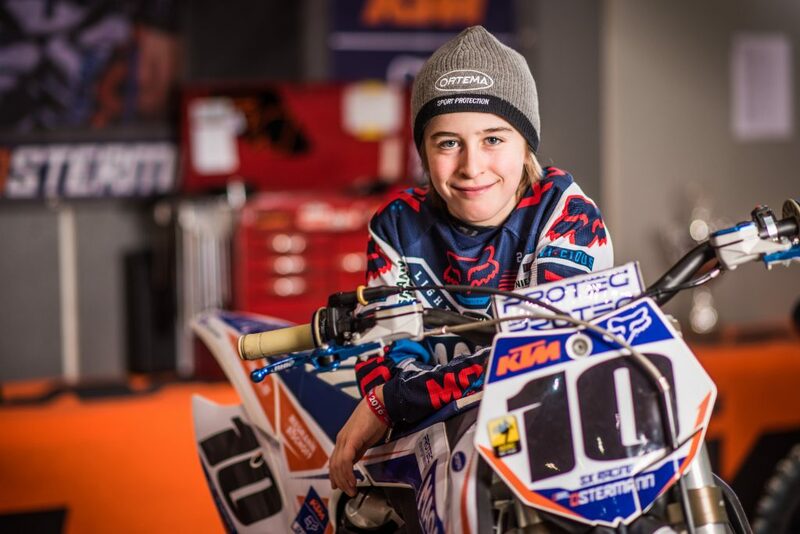 The twelve-year-old is being trained as a Supercross specialist by Motocross legend Collin Dugmore. “Hello, and who are you?” asked Dugmore. 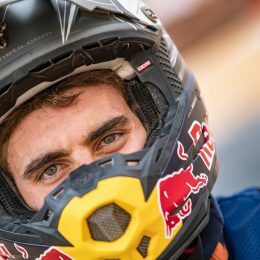 Collin Dugmore, five-time German champion, has seen a lot in Motocross. But this little kid in front of him could supposedly ride a motocross motorcycle? They went into the garden, Carl opened the throttle and raced round in a circle so fast that Dugmore could hardly believe his eyes. “I was impressed,” says Dugmore. Since then he has been little Carl’s coach. He’s teaching him the right technique: the Supercross technique. Because that’s what Dugmore’s training program is targeting: Supercross, not Motocross. Nothing of the sort has ever been done in Germany before: grooming a young rider specifically for Supercross. Dortmund, the second weekend in January. The traditional ADAC Supercross event. The Westfalenhalle exhibition center is packed to the rafters for an impressive show with strobe lighting, techno music, and pyrotechnics. The stadium announcer is on fire. The arena goes wild when he shouts “Let me hear you Dortmuuuuuuund.” So everything is great? Not entirely. Because the German-speaking riders have nothing to shout about at their home race. In the highest category, the SX1 class, riders from the USA, France, and Great Britain dominate. Many of them were enticed to Dortmund with a five-figure sum. They are all Supercross specialists. But where are the Supercross specialists from the German-speaking countries? There aren’t any. In this part of the world, Motocross riders prefer to concentrate on conventional outdoor Motocross. They shy away from typical Supercross sections like washboards and triples. But back in the paddock in Dortmund, the future is on its way. Right at the front in the middle by the entrance is Carl Ostermann‘s tent. With his KTM neatly positioned, Carl sits at a table in front of it with posters giving autographs. He writes simply “Carl” and “10”, his race number. Carl reckons there’s no need for his last name. The broadcaster WDR is there too; first an interview with Dugmore, then Carl. 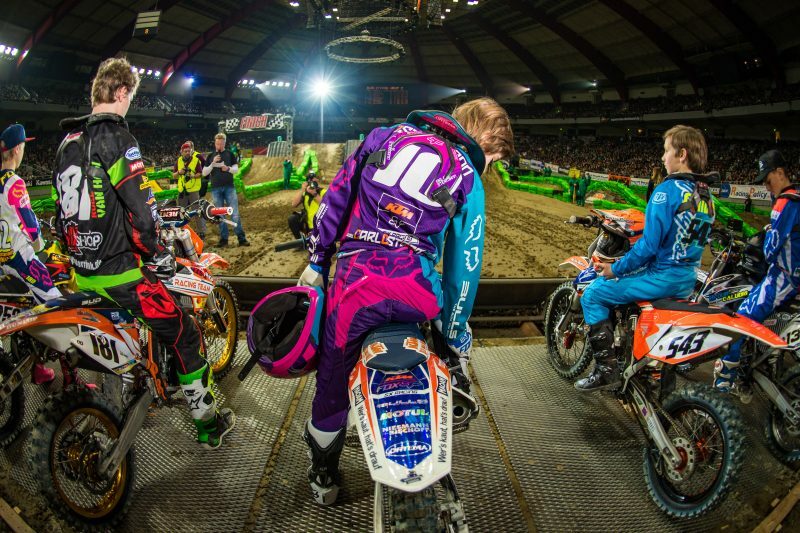 Is this where the talent that will bring German Supercross out of the shadows will come from? In the 50 and 65cc category, Carl was the high flyer. 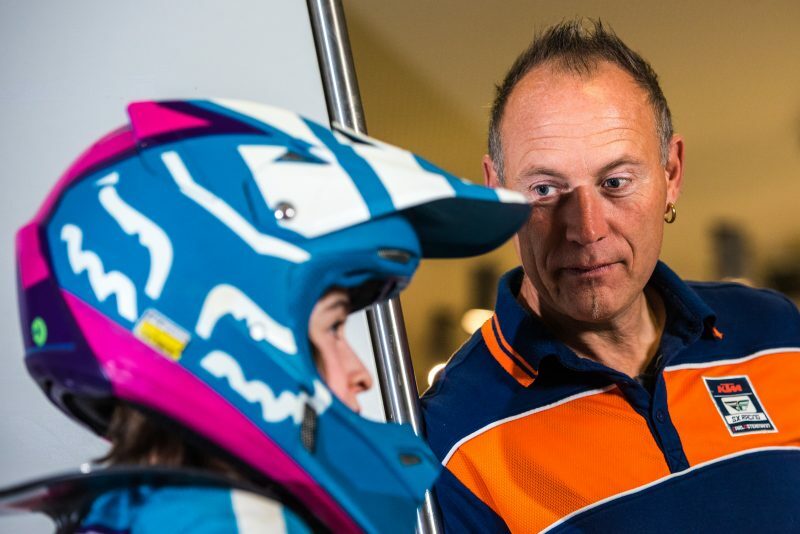 He won the SX4 kids class in Dortmund four times. But now he’s gone up a class to SX3, 85cc. There he’s one of the youngest in the field at just 12 years of age. Some of his opponents are 15, with the height and strength to match. 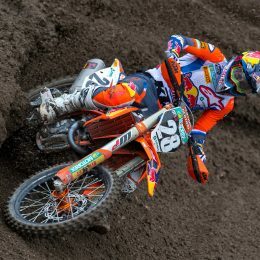 That’s a deciding factor in a sport like Supercross, where the rider’s physique plays a huge role. 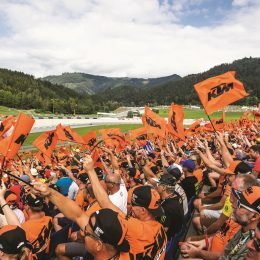 “Carl is lacking physically,” says Collin Dugmore, but he also knows the strengths of his protégé: “Carl’s technique is excellent, his bike control is fantastic.” That was always the signature of the Motocross legend and former KTM rider too. The South African has lived in Niederroßbach in Westerwald for many years; his German is perfect. He runs the “Collin Dugmore Offroad Schools”. Motorsport clubs or race teams can enlist him to come and pass his knowledge on to the young riders. But Dugmore’s particular focus is Carl Ostermann. The task of training a Supercross specialist is what attracted Dugmore to Carl. “Because in Supercross,” says Dugmore, “you have to ride much more precisely than in outdoor Motocross.” Dugmore raves about the big stars, over in the States; the Dungeys, Musquins, and Roczens. “Over there you can put a coin on the ground and they’ll land right on it after a thirty-meter jump, lap after lap.” That’s what he wants to teach young Carl. But in Dortmund – the highlight of the German Supercross season – Carl struggles, coming in sixth out of eleven riders in the SX3 category; Carl and his father were hoping for more. Fifty-three-year-old Thorsten Ostermann runs a variety of hospitals and rehabilitation clinics. That provides the financial means to lay the foundations for Carl’s success. He bought a big tennis hall and had a Supercross track built in it so that Carl can train four times a week. Carl’s career costs him a six-figure sum every year, says Thorsten Ostermann, but that’s nothing in comparison to the horse riding careers of Carl’s sisters, Luise and Johanna. “If horse riding was as cheap as Supercross, our family would be better off,” says Thorsten Ostermann, laughing. The division of tasks for the Dortmund weekend: Dad accompanies Carl, as always, and Mom looks after both daughters at a talent scouting meet. The Ostermanns are close friends of the Riegel family, who own the confectionery company Haribo and also live in Bonn. That’s how Carl came to be sponsored by the Haribo brand Maoam. There is always a plate of Maoam chewy candies at Carl’s autograph sessions. Sometimes he scribbles his “Carl, 10” onto a candy for those fans that are even younger than he is. This year, Dad and Collin are planning for Carl to compete in the French Supercross series that starts in the summer. Then come the four ADAC SX Cup races in Stuttgart, Munich, Chemnitz, and Dortmund and from January 2018 he may go over to the UK for the Arenacross Championships there. Sounds like a demanding winter for a twelve-year-old, who is currently in seventh grade at the International School in Bonn. The school advertises itself with the slogan “Excellence is our standard” and the same goes to some extent for the aspirations that Dad and Collin Dugmore have of Carl’s Motocross career. There’s no need to ask who Carl’s role model is. “Ken Roczen” he fires off. Roczen, the talent from Thüringen, emigrated to the USA years ago and is one of the biggest stars in the AMA Supercross series. 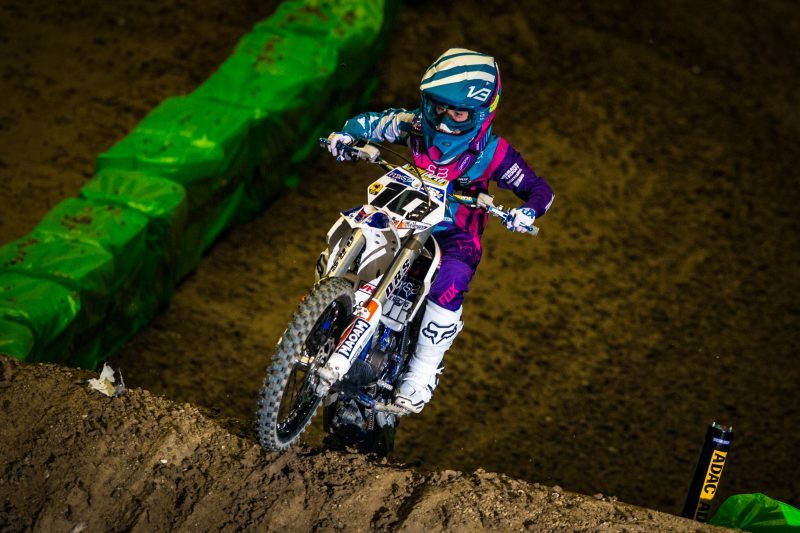 Of course, Dad and Coach Collin Dugmore know that Carl will have to go to America at some point if he wants to make it to the top of Supercross. But they also know that it’s a long road until that point. It’s a long road until Carl the kid might just become Carl the champion.